More than one year the company Alcatel absent from Indian mobile market. Now the company entered to Indian market with Alcatel OT 5020E dual SIM Android based smartphone. It sports a stunning 4-Inch WVGA capacitive touchscreen with 800 x 480 pixel screen resolution. 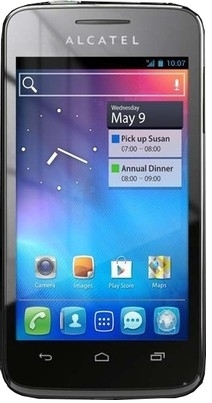 The smartphone loaded with Android v4.0 (Ice Cream Sandwich) operating system. The dimension of this smartphone is 64.0 x 123.2 x 10.9 mm. It powered by powerful 1.0 GHz Dual-Core processor and 512 MB RAM. For capturing needs there is a 5.0 Megapixel rear facing camera with Fixed Focus and LED flash features and there's a 0.3 Megapixel front facing camera for making video calls. The device has 1.4 GB internal memory for storage needs and it expandable up to 32 GB via MicroSD card slot. Alcatel OT 5020E smartphone built-in with 1500 mAh Li-Ion rechargeable battery. Battery offers up to 400 hrs stand-by time on 2G network and up to 410 hrs on 3G network and up to 13 hrs talk time on 2G and 3G network. This droid features connectivity facility through 3G, Wi-Fi Direct, DLNA, Bluetooth, and GPS. Th device pre-installed with Android browser, it features smooth web browsing. For entertainment needs it has a Music player, Video player, and SRC Surround Sound enhancement features enabled. Light sensor, G-sensor, and Proximity sensor enable. Alcatel OT 5020E smartphone now available through major online retailer stores in India for Rs.7,499 INR. Alcatel OT 5020E Android smartphone now listed on India's online retailer store Flipkart for RS. 7,499 INR.